As the blade of the guillotine slowed in the aftermath of the Terror, Napoleon took up the reigns as First Consul and French explorer Nicolas Baudin proposed an ambitious voyage to “interest the whole of Europe” . It is also where Nicole Starbuck begins Baudin, Napoleon and the Exploration of Australia (2013). A commoner by birth, Baudin made his name as a member of the French merchant marine and French East India Company, eventually captaining a scientific voyage to the Caribbean. 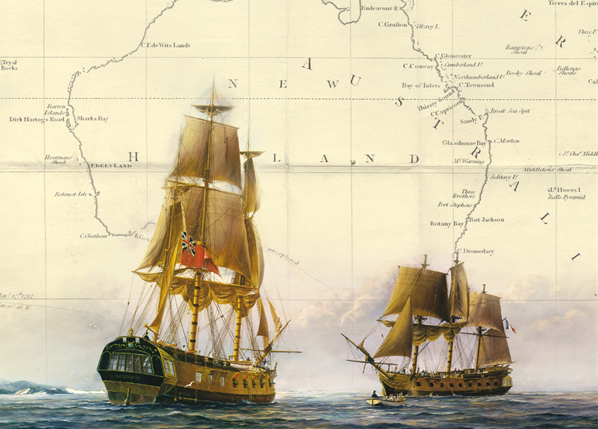 However, his 1802 Australian voyage was unique in its narrow scope of exploration, and its unprecedented twenty-two participating naturalists and scientists. This voyage was the first to emphasize specialized knowledge acquisition and scientific detail, a shift from earlier Enlightenment explorations, when natural history was seen as “a sweeping and largely philosophical study of the natural environment…implicated in questions about rationality” . By arguing that this trip was unique to those Enlightenment expeditions that preceded it, as well as those trade and territorial excursions that would follow, Starbuck contextualizes the voyage in a much more meaningful and nuanced way, framing it as “above all, a Consulate-era voyage – a new voyage for a new nation” . Historically, academics such as John Dunmore have described Baudin’s voyage as the last great Enlightenment voyage. While later depictions by Carol Harrison define it as a Revolutionary expedition, Starbuck seeks to carve out a new place in the historiography, between Enlightenment and Revolution, as well as emphasizing the importance of the unplanned Port Jackson sojourn in understanding and analyzing the intricate historical context. Detailed descriptions of daily life both on board the ships as well as in British Port Jackson, reinforce her argument as well as emphasize the individuality of the sailors and colonists involved. As a whole, the work convincingly represents Baudin’s journey as the only scientific voyage of Napoleon’s era, representative of a transitional context that was influenced by the shifts in both post-revolutionary Metropolitan France as well as the ongoing Anglo-French relationship within the broader colonial sphere. As a story of global voyage on the high seas, this work of discovery presents a unique window into the shifting environment in Metropolitan France between revolution and the age of the Grand Empire. Starbuck takes into account the plethora of contextual factors that impacted the flavor of this voyage including French societal shifts to a more meritocratic worldview wrought by the French Revolution (1789-1799) coupled with the unique naval lifestyle, arguing that “the reforms of the Revolution had accelerated a move toward meritocratic practices and imposed Republican ideology but it had not altered the traditional hierarchical structure of the navy” . Her acknowledgement of the continued importance of maintaining a hierarchical leadership on board the ship is reflected particularly well in her depictions of Baudin himself, whose firm leadership was crucial for the success of the voyage as well as her argument that sailors “were less concerned about political ideals than about security and stability” . The British had only begun colonizing Australia in 1788, with the founding of Port Jackson on January 26. Taking into account the historic Anglo-French rivalry and recent conflict stemming from the French Revolutionary Wars, ended by the short-lived Treaty of Amiens (1802), Starbuck rightly points out how “the expeditioners needed to remain conscious that they were not alone but performing in a colonial theatre” . As Starbuck contends, the colonial environment in which the Anglo-French interactions took place contained elements of uncertainty and mistrust as well as mutual interest in the sharing of new knowledge, seen particularly in the British contributions to Baudin and other naturalist’s collections. Nevertheless, in light of such prolonged great power rivalry, Philip Gidley King, the British governor of the newly minted colony, maintained rather understandable suspicions towards his French ‘guests’. He limited their movement around the region, thus curtailing their ability to act freely in their scientific endeavors. Starbuck’s rich depictions of the relationship between the two parties are enriched by her discussion of more normative factors, arguing that day-to-day relations “would be shaped mainly by negotiations around Anglo-French politics of knowledge, honour, and authority” . Baudin and England’s Matthew Flinders meet in Encounter Bay on 8th April 1802. By Marine Artist John Ford. Courtesy State Library of South Australia. On the other hand, whereas interactions between the French and British were complex, Starbuck argues that Baudin’s expedition resulted in few interactions with the Aborigines, a fact that belied burgeoning modern concepts of human rights and ideas of civilization. Starbuck successfully surmounts the difficulties surrounding a relatively small amount of available archival material. She also deals well with the lack of description pertaining to the use or importance of Aboriginal objects as well as the further detached nature of the records that described interactions with Aborigines, emphasizing ethnographic trends that attempted to look for similarities between different peoples that would confirm ideas about the universal capacity for human progress and ‘civilization’, led by Western efforts. As a result, Starbuck’s assertions remain convincing, emphasizing the varying individual techniques and approaches taken by scientists, botanists, and ethnographers. For example, while scientist François Péron emphasized “the gentlemanly, civilized nature of the activity”, mineralogists Charles Bailly and Louis Depuch focused their commentary on specific scientific findings, simultaneously grounding them in the colonial context [132, 136]. Overall, Starbuck has presented a colorful post-revolutionary portrait of Baudin’s voyage, representing not only the great passion and commitment that Baudin maintained throughout the expedition, but also the many factors that influenced the flavor of the journey. Starbuck illustrates how this voyage uniquely represented a time of transition and change not only within Metropolitan French society, but also on a global scale, which would shortly see massive increases in trade and imperial conquest. This period was representative of tensions not only between countries (France and Britain) but also between ideologies, in the questioning of concepts such as civilization, human rights, national identity, and knowledge. She brings a fresh and engaging perspective to a voyage that grants glimpses of a changing world. As Starbuck shows, it is only within this complex and intricate context that the nature and significance of Baudin’s voyage can properly be understood.